The National Garden Bureau has chosen cucumber as its vegetable to promote this year. Thus, 2014 is “The Year of the Cucumber”. Cool and refreshing on a hot summer day, cucumber is one of America’s top five garden vegetables. For years, cucumber was considered to be primarily “diet food” because of its low caloric content. Recent research, however, has shown this water-laden vegetable contains significant amounts of phyto-nutrients which have a wide array of human health benefits. While March is a bit early to plant cucumbers in our gardens, it is a fitting month to take a closer look at this interesting vegetable. Cucumber (Cucumis sativus) belongs to the Cucurbitaceae family. Other important members of this family include watermelon, muskmelon, pumpkin and squash. Native to India, cucumber is another one of our most ancient vegetables. Cave excavations have revealed that cucumber has been grown as a food source for over 3000 years. Early cucumbers were probably very bitter because of compounds they contained called cucurbitacins. These natural defense compounds act to repel insects and other pests. Bitterness still is a problem with some cucumbers today, although great progress has been made by plant breeders to eliminate the bitter compounds. 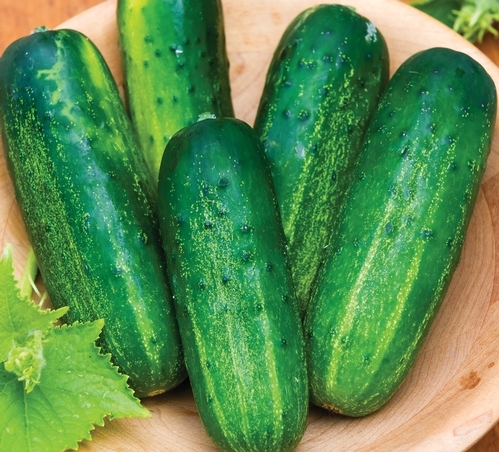 Cucumbers were cultivated and eaten in ancient Egpyt as evidenced by the Bible. Numbers 11:5 reads: “We remember the fish, which we did eat in Egypt freely; the cucumbers, and the melons, and the leeks, and the onions, and the garlick”. Evidently the Egyptians made weak liquor from cucumber by cutting a hole in the ripe fruit, stirring the inside with a stick to liquefy it, plugging the hole and then burying it in the ground for several days. The resultant concoction was unearthed and consumed. The previous probably should be followed with the warning: “Don’t try this at home”. The Greeks also cultivated cucumbers as (later) did the Romans. The Emperor Tiberius was said to have demanded that they be on his table every day. To meet that demand, his gardeners fashioned some of the first plant forcing structures, constructing portable containers which they moved from place to place. Later, the Romans advanced plant forcing structure technology (and cucumber production) by fashioning frames covered with translucent panes of silicates—not unlike our modern cold frames. Later, Charlemagne was said to have grown cucumbers in his gardens in Italy in the 8th and 9thcentury. Cucumber later spread to Western Europe. It was during the reign of King Henry VIII that cucumber made its way to England. His first wife (Catherine of Aragon) was said to have demanded them for her Spanish salads. The Age of Discovery proved to be very important to the spread of cucumber. Columbus is credited for taking cucumber to the New World, along with many other vegetables. He introduced it to Haiti in 1494. From there it spread. In 1539, De Soto judged the cucumbers he found growing in Florida to be better than those of native land of Spain. By 1806 eight varieties of cucumbers would be found growing in America’s colonial gardens. As mentioned previously, scientists recently have found cucumber to contain a number of beneficial phyto-nutrients. The lack of that knowledge did not keep cucumber from being used medicinally earlier in our history. The cucumber’s water retentive ability earned it the reputation for never losing its cool. As a result, 17th Century physicians prescribed placing fever patients on a bed of cucumbers so they would become “cool, as a cucumber.” Additionally, it was thought that if cucumbers were eaten three times daily, red noses would be healed and pimples on the face would disappear. Trappers and fur traders probably were responsible for introducing Native Americans to cucumber as they made their way across the country. Reportedly, this expansion was interrupted somewhat in the 18th century when medical journals warned of the dangers of eating cucumbers and other vegetables not adequately cooked. The set back was short-lived and by the 19th century cucumber regained its popularity in the U.S.
Cucumber’s popularity was bolstered considerably when, in 1876, Henry J. Heinz added pickles to the list of products made by the food processing company that bears his name. Others followed, and by the end of the 19th century pickles were a tasty addition to the monotonous diet of meat and potatoes consumed by most Americans. Today, pickles can be found in 70 percent of all households, and Americans are said to consume nine pounds of them per capita annually. Cucumbers are placed into one of two major categories based on their use: slicing or pickling. Slicing cucumbers are eaten fresh from the garden. They range in size from about four to 12 inches and have skin that is relatively smooth. If “spines” are present, they normally are white. Pickling cucumbers are much smaller, ranging in size from one to five inches; the latter reserved for making dill pickles. Unlike the slicers, pickling cucumbers usually have bumps on their skin along with “spines” that are black. Gerkins are a type of immature pickling cucumber. They are noted for their small size and warty skin. Whatever the type, cucumbers contain cucurbitacins which can impart a bitter taste. Additionally, the taste is associated with a digestive condition and social indiscretion known as a “burp”. In the middle of the 20th century, “burpless” cucumbers were introduced that eliminated this problem. Today there are several burpless varieties available. Their fruit usually is long, somewhat narrow and thin-skinned. Non-burpless types can be made a bit more socially acceptable by cutting off about one inch of the stem-end and peeling the skin off the fruit. Cucumbers are relatively easy to grow. They prefer a full-sun exposure in a well-drained garden loam. Amending the soil with compost or other forms of organic matter will improve soil structure and increase yields. Check garden drainage before planting, since wet soil will promotes disease infestation and reduces productivity. Heavy feeders, cucumbers require fertile soil, nitrogen fertilizer, and/or additions of high-nitrogen organic matter sources. A side dressing of 5-10-10 fertilizer at the time of planting and once a month thereafter should be sufficient. Adequate amounts of water also must be provided since the fruits are largely water. Mulching helps to conserve water as well as control weeds. Cucumbers plants are vines and need room to grow. Standard types may spread four to six feet and should be spaced four to five feet apart. The restricted vines of dwarf and bush types may require as little as two square feet per plant. For earlier maturity, cucumbers can be started indoors in individual pots ten to 14 days prior to setting them out. If direct seeded, sow seeds when the soil has warmed up to 70°F. Place one seed every six inches, covering it with soil to a depth of one inch. Depending on conditions, seedlings should emerge in about a week. When the plants are two inches high, thin plants to one plant per lineal foot. An alternative method is to plant in “hills” four to five feet apart. Sow four to five seeds per hill and thin to three plants per hill after seedlings emerge. Cucumber is plagued by a number of troublesome insect pests. They include cucumber beetle (stripped and spotted), aphids and squash vine borer. Control of beetle is important for the prevention of bacterial wilt. Although there are pesticides labeled for the control of the afore-mentioned pest, some gardeners choose to use floating row cover over young transplants or seedlings to exclude the pests. The two most problematic diseases that afflict cucumber include bacterial wilt and powdery mildew. Bacterial wilt is controlled by eliminating its primary vector—the cucumber beetle. Incidence of powdery mildew can be lessened by providing adequate space between plants, eliminating weeds to increase air circulation, keeping the leaves dry by using drip instead of overhead irrigation, or using fungicides judiciously. Garden clean up in the fall also is helpful in reducing disease inoculums for the following growing season. Most cucumbers varieties reach maturity in 50 to 65 days. The fruit will be firm to the touch and the skin will have a uniform dark green color. Cucumbers enlarge (mature) rapidly and should be checked/harvested daily. If left on the vine too long, the fruit becomes over-mature and less desirable. Slicing types are mature when about six to eight inches long; larger slicing varieties should be picked before they are ten inches long. Pickling varieties should be harvested after reaching a length of one to four inches. In either case, refrigerate harvested fruit as soon as possible to preserve flavor and avoid desiccation. The largest cucumber ever grown was 67 inches long and weighed 154 pounds. Cucumbers contain 96 percent water. The inside of a cucumber can be up to 20 degrees cooler than its outside. One-half cup of sliced cucumbers contains only eight calories. Fresh extracts from cucumbers have recently been shown to have both antioxidant and anti-inflammatory properties. Placing a slice of cucumber on the eyelid can reduce puffiness. However, the beneficial affect is due to cool temperature and not to the cucumber per se. Try rubbing a cucumber slice over themirror in your bathroom; it will eliminate the fog andprovide a soothing, spa-likefragrance.